Make your surveys secure with these safeguarding features by which you can determine how your surveys will be accessed and by determining who can access reports through sharing. 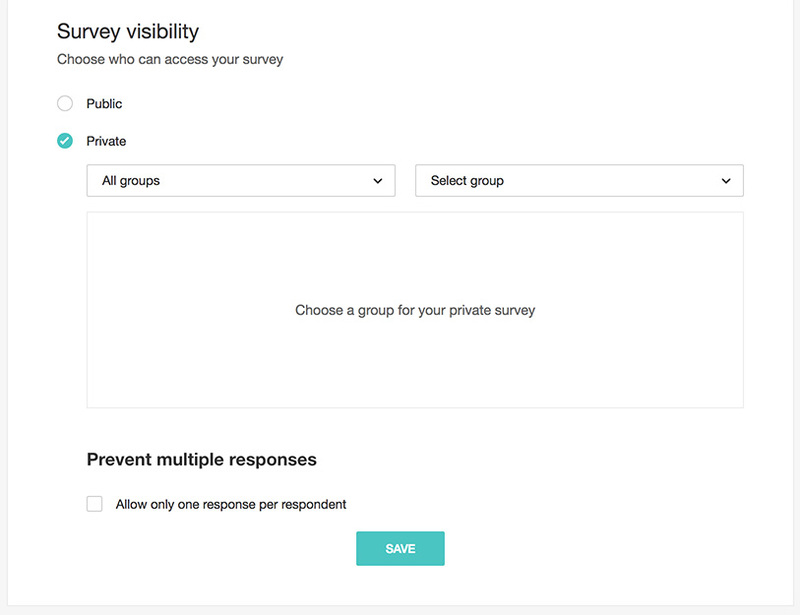 Set the visibility of a survey to public so that anyone can respond, or make it private to target specific groups. When you share a survey with a private group, only the members of that group can respond to it. This feature is useful for people who have registered as an organization with Zoho. How do I assign visibility settings in my survey? Click Visibility on the left pane. Click Public to allow anyone to access your survey. This is the default setting. Click Private to publish your survey to a specific group. Click All Groups to select any group from a list of all the groups. Click Organization Groups in the dropdown list to select a group related to your organization. Click Personal Groups in the dropdown list to select one of your personal groups. Select the appropriate group in the Select Group dropdown list with whom you want to share the survey. The selected groups will be displayed. Click Members to view the list of members in the group. Click X next to the selected group to cancel the selection. Check the Allow only one response per respondent checkbox to prevent multiple responses from the same user. This restricts multiple responses from a single computer by using browser cookies. 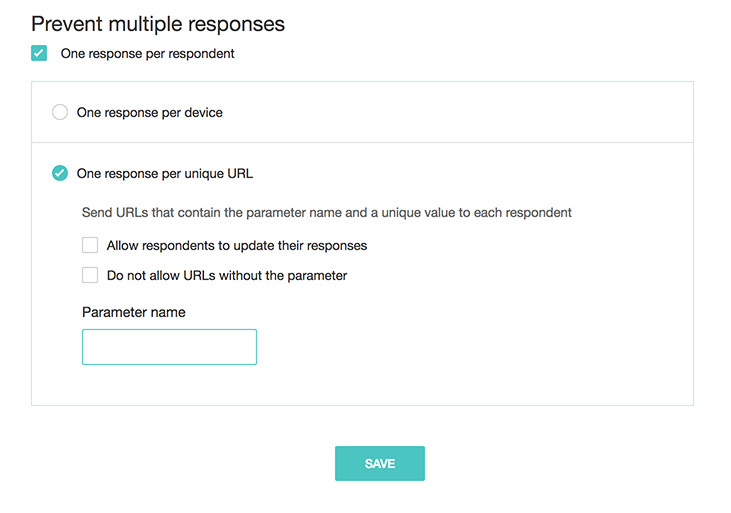 Select Allow respondents to update their responses if you want users to edit their responses whenever they want to. Set restrictions on your survey and specify how many responses you want or when to close your survey. You can also prevent the same user from entering multiple responses. How do I set restrictions in my survey? Survey end date: Stop receiving survey responses on a certain date. 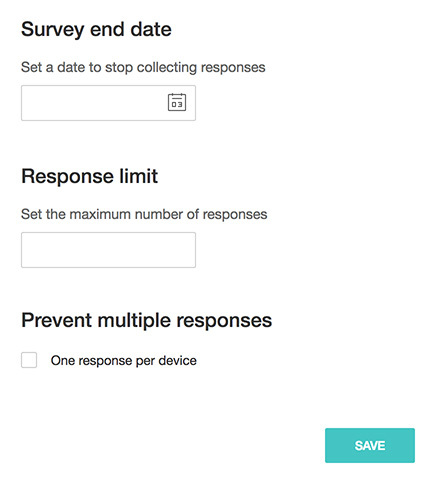 Response limit: Set a limit for the number of survey responses you receive. Collect IP address: Enable or disable collecting IP address of the respondents in the reports. One response per respondent: Restrict multiple responses from a single computer by using browser cookies. Allow respondents to update their responses: Allow respondents to update their survey responses any time—even after they've submitted it. One response per unique URL: Generate a unique URL for each respondent. Do not allow URLs without the parameter: Restrict responses that don't have a certain parameter. This will be added to the URL of the published survey. Parameter name: Type the parameter name that will be appended to the URL. 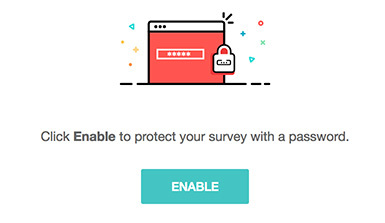 Protect your survey with a secure password. How do I set a password for my survey? Click Password Protection on the left pane of the Launch tab. Type in a strong password (Six characters min) in the Set a password box. Rename the password or submit labels, if desired. 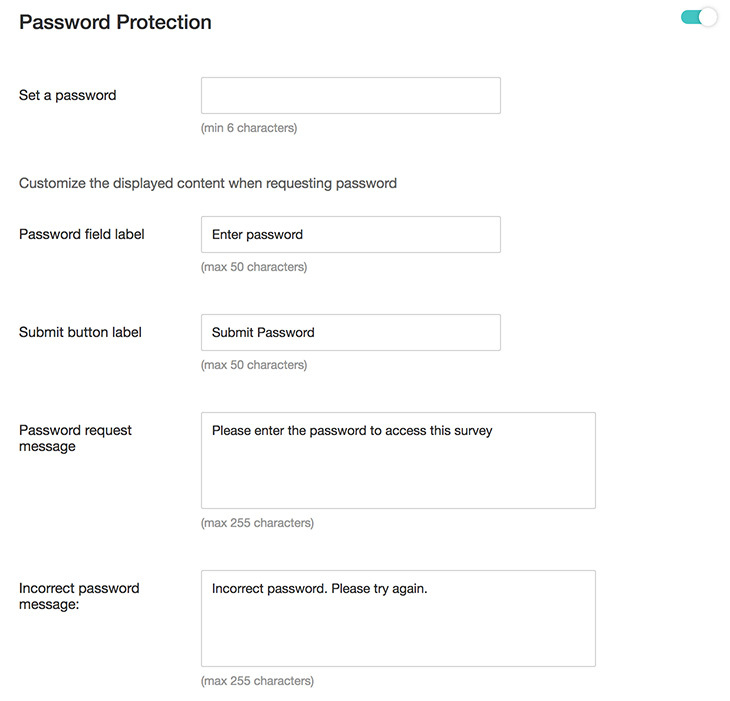 Complete the Password request message field to prompt users for a password whenever they try to access the survey. Customize the message as needed (255 characters max). Fill in the Incorrect password message field to display an error message when someone enters the wrong password. Customize the message as needed (255 characters max). Turn OFF in the top-right corner of the section to disable password protection. The knob will turn gray.